AT&T is launching the Samsung Galaxy Note 8.0 on June 21st. For those of you who want more than what a traditional tablet offers, the Galaxy Note slab might be your ticket. Not only does it support the S Pen, it also has many of the same features that are offered on the Samsung Galaxy S4 like Smart Stay. This feature uses the front-facing camera to make sure that you are still awake and watching a video. Once your eyes close or are diverted from the screen, the video pauses. Multi-Window, which allows you to split the screen and use two apps at once, is also on board as is Air View. This allows you to hover your finger over an email and read it without touching the screen. And the tablet is perfect for business use with the inclusion of Samsung's SAFE technology which brings an added layer of security to certain functions. Normally, the Samsung Galaxy Note 8.0 will be priced at $399.99 at AT&T with a signed two year contract, but the carrier has a bundle deal for you. Buy a Samsung Galaxy S4 or a Samsung Galaxy S4 Active or a Samsung GALAXY Note II and you can buy the Galaxy Note 8.0 for only $199.99 on contract. By updating the AT&T Locker app and going to the Account Tab and My Plan, you will also receive 50MB of cloud based storage for free. AT&T Locker allows you to save pictures, videos and files and retrieve them from multiple devices. 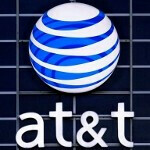 For more information on the Samsung Galaxy Note 8.0, click on the video below to view AT&T's Mobile Minute. I was about to be upset because I *just* bought the wifi version. But oh, that's on contract. No thank you. I was about to be glad, but as soon as I saw AT&T. oh, that means no cellular connectivity. No, thank you. I thought buying something on contract you would save money? I guess that's not the case here. Well, were you going to use the cellular data anyways? If so, then yes, you're probably saving money. No? Then you save money, but pay more up front. The wifi only version is $399/16GB at costco.com, but you can't add cellular internet later. Is the extra bit worth it for you? Noo but if I'm going to get the Note 8.0 I'd pay for the WiFi model, use my phone as a hotspot and get the updates first and not have to wait for At&t to push that out. There's nothing wrong with that. I'd be more tempted if it was a bundle offer that included the LG Optimus G Pro (look, flying pigs!). So, yeah. No go for either of us :P The main thing I like about the cellular tablets is that they have their own juice. Then I don't drain my battery faster by making my phone a hotspot. The note 8 is a overpriced piece of plastic. The one I had out of the box had screen banding to the point I couldnt even see the screen. and yet, you keep buying..